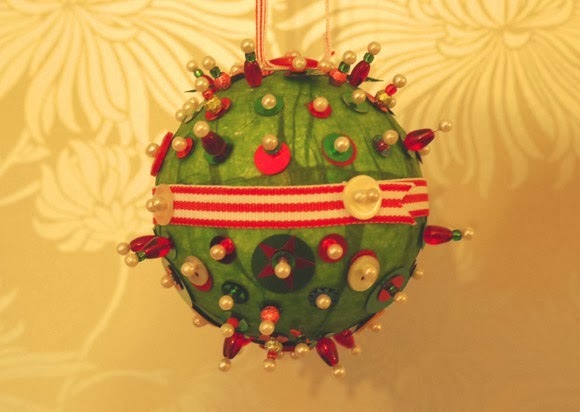 Christmas 'Kissing Balls' date back to the Middle Ages when they were known as 'Holy Boughs' fashioned from evergreen sprigs and twines with a small clay figure in the centre to represent the baby Jesus. Hung over doorways and passageways, it was believed that blessings would be cast on all who passed underneath. During the Victorian era, these 'Holy boughs' evolved to 'Sweet Balls' as the tradition for Christmas decorations stepped up a gear. People would stick sprigs of evergreens, holly, berries, mistletoe and herbs into a potato or apple and hang them by ribbon to act as both a decoration and an early form of air freshener! The balls acquired certain romanticised symbolism as each herb, plant or flower used to decorate them came to represent love, piety, charity and more. As times moved on, Kissing Balls fell out of fashion, with only the mistletoe remaining as a symbol encouraging kissing throughout the festive season. 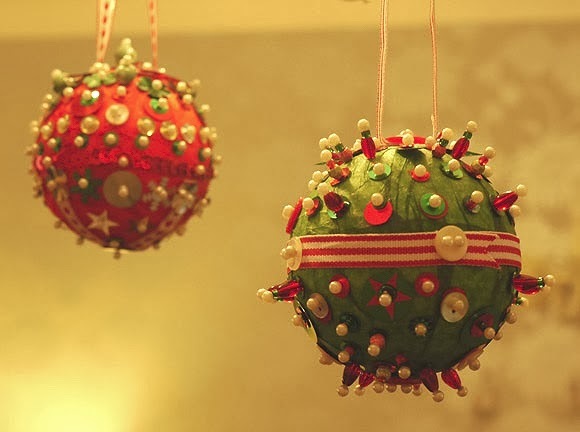 Kissing Balls themselves became popular accessories for weddings, but now - with traditional Christmas decorations as popular as ever - they are making a comeback as simple, easy to make festive decorations . . . These days, you don't need a potato or apple or even prickly sprigs of holly! In fact, you can find everything you need at your local craft shop or (if you're like me) the back of your cupboards! If you're interested, follow these five easy steps to making your very own Kissing Ball. As you can see, we had a go chez Lily in the Labyrinth - one cold Saturday night we stuck on Strictly Come Dancing, settled down with mugs of hot chocolate and got to work pinning all manner of pretty beads and buttons to paper-covered polystyrene balls. In no time at all, we had some charming decorations (ok, a little 'basic', but who's judging?) that hadn't cost the earth and will be ours to enjoy for years to come. To make your own, read on . . .
1) Using a side plate or large saucer as a guide, cut two circles of tissue paper. 2) Cover your polystyrene ball with a thin layer of PVA glue and cover with the tissue paper circles - start from the middle of the circle and smooth the edges down over the ball then repeat over the other half of the ball with the second circle. 3) Wait for the ball to dry - pop in the airing cupboard or blitz with a hairdryer to speed this up if you like. 4) Decorate the ball by placing beads, buttons, sequins and ribbons on the ball and securing with pearl headed pins. 5) To hang your ball, secure a loop of ribbon to the top of the ball with a number of pins. I anchored mine down with a four-holed button with a pin in each hole. Hang your homemade Kissing Ball and enjoy for years to come! Let Lily Know: Will you be making any decorations this festive season? Thanks for sharing useful post. I wanted to make Christmas decoration with polystyrene but I don't know how can I make this with polystyrene. Then I found you and now after you post I can do it very easily because your post help me a lot and give a right way to make this.